Colorado was among the first states to legalize marijuana for recreational use. While it is legal to purchase marijuana, it is not legal to smoke in public. This means that are not the famous hash coffee shops as there are in Amsterdam. There are many different efforts to get around that public marijuana smoking prohibition. Some worry that a new church might be one of these efforts. According to a recent news article from the Cannabist, a new church, known as the International Church of Cannabis, allows people to smoke cannabis in a public setting. 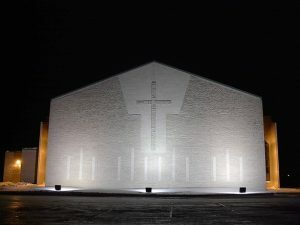 The church is in an historic church building that was purchased and renovated so that it could be used as a church for the newly founded religious movement known as “Elevationists.” The church was approved as a not-for-profit organization and its opening was on April 20, 2017. April 20, which his better known as 4/20, has become the unofficial international marijuana holiday. The founders of the church insist that this is a church to honor a legitimate religion that features the sacrament of cannabis. On the other hand, skeptics, including law enforcement officials, believe this is simply an attempt to use the cover of the First Amendment of the Constitution to get around the prohibition on using marijuana in a public setting. They argue that this is simply a private social club such as the ones created during alcohol prohibition in the 1920s. Like Colorado, California has passed a legalization of the recreational use of marijuana act at the ballot. However, with legalization comes various restrictions and also a lot of seeming gray areas in the law. The reason for this is because of certain state restrictions as well as the fact that marijuana remains illegal under federal law. This was not a problem under the last half of the Obama administration, because it was determined that federal enforcement of marijuana laws would not be a priority in areas where it is legal under state laws. However, it was always known that this could change with a new administration. While it hasn’t happened yet, the new attorney general, Jeff Sessions, has said that “good people don’t smoke marijuana,” and he intends to reevaluate enforcement efforts in states where recreational marijuana is legal under state law. While he hasn’t discussed state legal medical marijuana, it does signify that a major change in policy may be coming. Since the laws are in a constant state of flux, it can be hard to stay clear of any of trouble and focus on running a legitimate and profitable business. The best thing you can do if you are already in business or planning to enter the business in the near future is to speak with one of our experienced Orange County cannabis industry attorneys. This will help make sure you are doing everything correctly and within the bounds of ever-changing laws to the fullest extent possible. This will allow you to focus on actually running your business, rather than trying to figure out if you are doing things properly.